The birth of a baby boy or girl is one of life’s most significant moments, and it should be celebrated with special jewellery worn every day that shares your story. Are you looking for the perfect gift for a new mother? 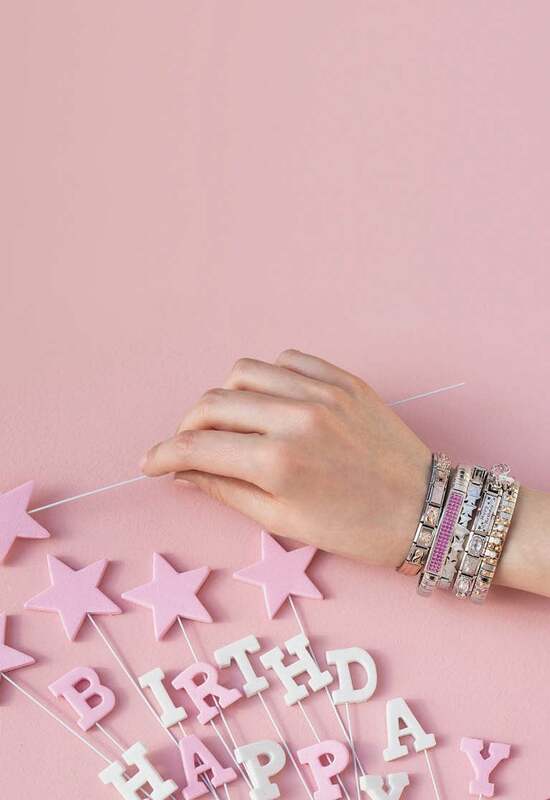 Discover all the Nomination gift ideas: you’ll find personalised bracelets, necklaces, rings and earrings all dedicated to new mothers. Discover all of Nomination’s ideas in order to give the perfect jewellery for the birth: every new mum will find the accessory that’s right for her, with quality that’s guaranteed Made in Italy. In fact, Nomination jewellery isn’t just a trendy accessory: all bracelets, necklaces, watches, rings and earrings are made of top quality materials, such as yellow and rose gold, silver, stainless steel and coloured gemstones. With Links and charms from the Composable Collection, you can create a personalised bracelet: each new mum can build exclusive jewellery for the birth of her baby with writing dedicated to family and motherhood, with symbols such as baby shoes and prams with details in blue or pink enamel, and with coloured gemstones that celebrate the joy of moments like this. There are many Classic and Double Links to choose from which have precious yellow and rose gold plaques decorated with inscriptions reminiscent of the happy event. Or you could choose a pre-made Composable bracelet with a baby theme that’s ready to wear. Discover all the bracelets and Links to dedicate to a special new mum. Rather than getting her a bracelet, do you think the right way to celebrate the wonders of being a first-time mum is with a necklace? Among our jewellery options you’ll find several necklaces in stainless steel and sterling silver perfect for a woman who has just given birth to a beautiful baby boy or girl. It’s important to remember that a new mother is first and foremost a woman whose femininity should be celebrated, especially in moments like this. Choose one of our precious necklaces as a gift and put a twinkle in the eye of an amazing woman, thanks the brilliant details of elegant jewellery. Hearts, gold details, brilliant gemstones: the wonderful ring decorations to dedicate to a wonderful new mother. Among the proposed selection you’ll find stainless steel and silver rings, many of which are also available with precious finishes in yellow and rose gold. Choose the ring that best suits her style and look: a stretch ring or a more classic model? The stretch ring is embellished with tons of different details and is a statement piece that also works with a more casual, everyday look. Those looking for more delicate jewellery can instead opt for a more classic ring: thin, bright, decorated with sweet details such as bows, hearts and rounded shapes. Whatever model you choose, there’s only one must: shine bright like a star!